Does the Roof of Your —- MI Home or Office Have Any of These Problems? Your Roof has to defend your home against the harshest of Michigan weather: Snow storms, heavy rains, tornadoes, hurricanes, and more. To do this, your roof has to be strong, sealed tight, and structurally sound so it can keep your place dry and free of water damage. – Flat roofs are prone to the same issues as pitched roofs, but they experience them at a much higher rate. If a flat roof is not installed correctly, it can be racked with damages. Poor drainage and snow build up (always a huge issue during the tough MI winters) can quickly lead to disaster. We can help you. – It is important that you have your steel or metal roof inspected and repaired by an expert that is trained to fix this type of room. Simply put, steel roofs require different repair skills than traditional shingle styles. – lack of tape sealant under screw heads, not enough sealants at the seams, and insufficient caulking – can all lead to huge headaches. Too often in the Western MI area, unqualified roofers are called in to deal with steel roofs problems. But, because they are not trained to hand this style of roof, they only make things worse. We have expert steel roofers on staff to help you. – Much like steel, gravel roofs require a specialist. Don’t let your roof get ruined! We can help you. – It may look pretty, but snow can wreak havoc on your roof. Ice and snow add an incredible amount of weight to, and put a lot of pressure on, your roof. Removing snow is not a do-it-yourself job! It can be extremely dangerous, and a great deal of work. Let us help you safely, and easily, remove snow and ice before it damages your home or office. – Time and the harsh Michigan weather can warp, erode, and destroy your wood sheathing. When the sheathing goes bad, leaks start. We can replace and repair the wood, and keep your home or office dry. – If your attic does not have enough ventilation, it can cause a slew of nasty problems including: mold and mildew growth, blistering roof shingles, ice dams, and frost in your attic. Because venting your attic can be tricky, it is always a great idea to call in an expert. We can help vent your attic or roof ridge, and keep your home mold, mildew, and frost-free. – Whether you own a single office, or a number of commercial properties, roofing repairs can become expensive if you choose the wrong contractor. Many are simply not qualified (nor equipped)to handle large commercial jobs, and you end up paying too much. Keep your costs down, and get the repair done right the first time. 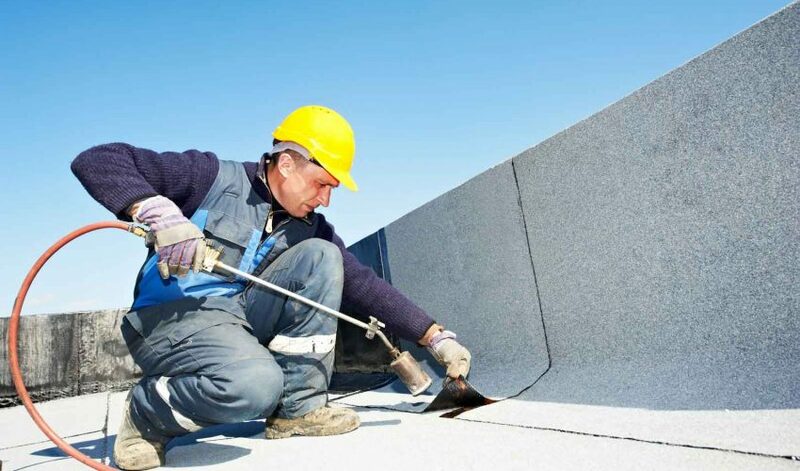 We can help you with your commercial roof repairs, no matter how big or small the job.